Entertaining article about the connection between Kraftwerk and Latin America. Remezcla Musica has a cool short article about the connection between Kraftwerk, Spain and Latin America. The same can be said about a lot of pop electronic artists; Depeche Mode, Erasure, Pet Shop Boys and on and on. Check it out!! 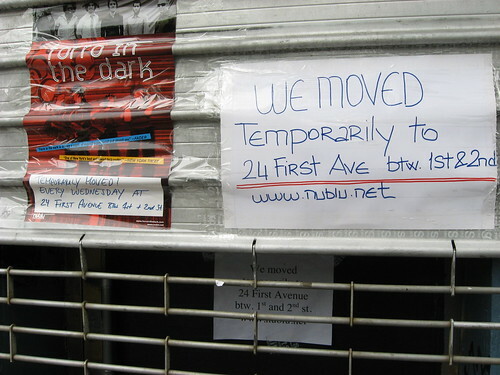 Nublu liquor license revoked and temporarily moved. I DJ’d at Nublu just about every month for 2 years, so this really saddens me. There aren’t many places in the world where you can hear jazz, reggae, funk, disco, house and techno all in one night. A diverse mix of people, live musicians and DJs makes Nublu one of the few places I’ve ever DJ’d where the rule is “there are no rules”. It’s an intimate venue with amazing staff and party people with a willingness to hear just about anything come out of the speakers. We’re in a time where the “music business” is struggling. The main way for musicians and DJs to earn a living is through the nightlife. I genuinely hope this all gets resolved soon and Nublu is able to return to normal operations.